Watch: For at-home viewing, only ESPN+. Golazo House “watch party” 6:30 pm. Bethlehem Steel will begin their playoff run with their fourth bout against Pittsburgh manager Bob Lilley’s Riverhounds this season. Pittsburgh won all three previous matches, with the third marking the Steel’s worst defeat of the season. The game will thoroughly test progress made with Bethlehem’s 2018 youth development project. Six weeks ago in Pittsburgh, Bethlehem failed the exam 4-1. Bethlehem’s lineup will reflect the first-team’s home game against New York Red Bulls 20 hours later, 300 miles away. 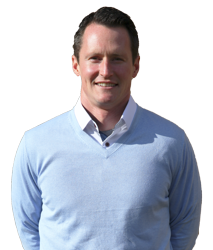 Goalkeeper John McCarthy should not be available to the Steel. Most of the gameday roster and staff traveled to Pittsburgh Wednesday in order to practice on the Highmark Stadium turf as much as possible. Additional Union first teamers may fly to Pittsburgh Friday in time for practice and fly home after the game. Philadelphia Union majority owner Jay Sugarman does not pay for has-been international superstars. But he spends generously for travel, food, and lodging to gain any possible advantage for his farm-team’s playoff game. 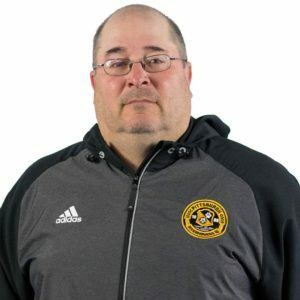 Shape: Riverhounds coach Bob Lilley plays one shape when he is uncertain of his ability to defend the opponent and another when he is more confident. When uncertain, the ‘Hounds play a 3-4-3, with an “empty bucket” as their attacking center midfielder. Adjacent players fill the bucket as circumstances warrant and permit. They played this shape in August in Bethlehem. When more confident, Pittsburgh play a 3-1-4-2, with one defensive center midfielder and two attacking center mids. They played the Steel this way in Pittsburgh in September and will likely play this way Saturday night. A second cogent characteristic of Pittsburgh’s shape is their defense’s ability to overload the “outside shoulders” of their penalty box, exactly where Steel like to jump-off for attacks. Using either of their shapes, Pittsburgh control these staging areas. The nearest central defender comes out, the outside midfielder drops back, and the interior central midfielder slides over. These three defenders – and more – flood the space, guaranteeing the attackers have no man-advantage before reinforcements arrive from behind the play. Santi Moar has been triple-teamed almost every time in his favorite left outside shoulder spot by such a Pittsburgh overload. Tactics: In either of their shapes, Pittsburgh defend like the rampaging Furies of ancient Hellenic mythology. The ‘Hounds are deadly on set pieces, especially on headers if six-foot-six defender Joseph Greenspan is playing. Pittsburgh’s Romeo Parkes, Neco Brett and Christiano Francois are pacey counter attackers, and now that Lilley can afford Kenardo Forbes, Ben Zemanski and others like them, Pittsburgh play possession well, better than Lilley-coached teams from the past. Squad rotation has been consistent all season, so the ‘Hounds older best eleven should be energetic even at the end of a 34-game season. Injury report (as of 10/14): Out – GK Kyle Morton (lower leg). 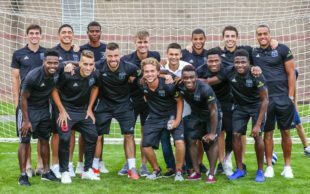 Predicted lineup (in a 3-1-4-2): GK: Dan Lynd; D: Joe Greenspan, Thomas Vancaeyezeele, Tobi Adewole; M: Mouhamed Dabo, Raymond Lee, Jordan Dover, Kenardo Forbes ©, Ben Zemanski; F: Nico Brett, Romeo Parkes. A pacey attacking option off the bench will be Christiano Francois. Mike Kirk will be the reserve goalie. What you have seen is what you will get. Shape: Bethlehem will play their 4-2-3-1 with the outside shoulders of the penalty area as prime staging areas for offensive activity. A third such area is zone 14, just outside the center of the box in the central channel. Tactics: Possession, control of the central channel of the central midfield, use of the big switch, attacking the flanks, and penetrating the green space behind Pittsburgh’s defensive line with pace. Defending as an 11-man team. Suspended: None. James Chambers’ fifth yellow card against Tampa Bay does not suspend him for the quarterfinal. Expected Starters: GK: Tomas Romero; D: Olivier Mbaizo, Matt Mahoney, Ben Ofeimu, Matt Real; M: James Chambers ©, Anthony Fontana; Michee Ngalina, Brenden Aaronson, Santi Moar; F: Chris Nanco. Bench: Faris, Aidan Apodaca, Omar Holness, Drew Skundrich, Prosper Chiluya, Brandon Aubrey, Kris Shakes. The game will turn on the three match-ups of the midfield battle. 1 & 2: Steel captain Chambers and Union teenager Anthony Fontana versus ‘Hounds captain Kenardo Forbes and seven-year MLS veteran Ben Zemanski. 3: Union teenager Brenden Aaronson versus ‘Hounds veteran Mouhamed Dabo. Unless Aaronson and Chambers do better than they did on September 7 in Pittsburgh, and unless Fontana does better than Drew Skundrich, Pittsburgh will dominate and win again. 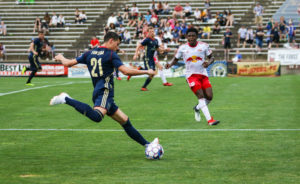 Aaronson signed with the Union six days after the shellacking alongside the Monongahela and has been practicing against MLS quality for a month. In that interval, his play has noticeably improved. Witness his game against the Rowdies Sunday. Fontana’s switch from no. 10 to no. 8 after the bad loss to Pittsburgh has produced similar improvement. If Fontana finds that special zone and plays better than he ever has as a professional, Pittsburgh will be surprised, will become uncomfortable, and will have to adjust. Pittsburgh is trying to beat Bethlehem a fourth straight time. The single elimination playoff will mitigate some of their complacency stemming from the third victory’s decisiveness. Since July 29th, except for the three Pennsylvania games with Pittsburgh and Penn, old age and treachery have not defeated Bethlehem’s youth and skill. Bethlehem will take the old men and their deeper, longer bench to overtime’s fourth available substitute (new rule, 2018). But they will surrender a goal in extra time and lose, 1-0. Great insight as always, Tim. Here’s hoping the Steel manage to keep this one close and sneak out with a W…. Getting the young players high leverage games will pay off in the future. Excited to see the plan coming together.